Personalise these cufflinks with custom text! Cufflinks make an excellent gift for anyone who likes to dress to the nines. 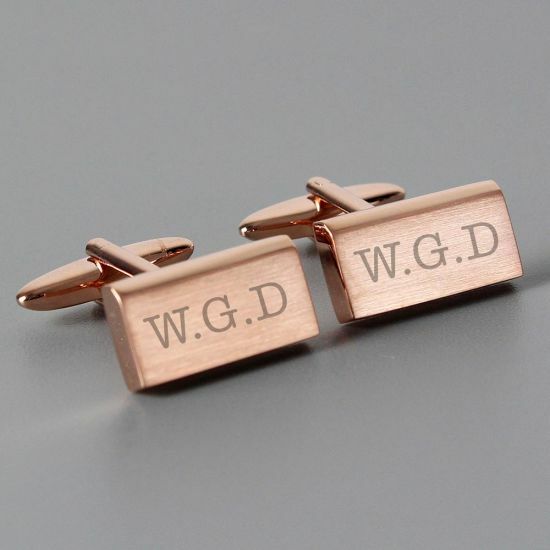 But, if you want to turn those nines into tens, you can add your own message to these personalised rose gold cufflinks! Plated in super-stylish rose gold, these cufflinks are as stylish as a young David Beckham (or an older David Beckham, for that matter). But, that’s not all they have to offer. You can make them more personal than a back rub by adding 5 unique characters of text to them – perfect for initials or a short name! These cufflinks are excellent for birthdays, Christmas, Father’s Day, weddings, and more. So, if you want to give a gift that shows you really care, order these personalised rose gold cufflinks today!